Q. 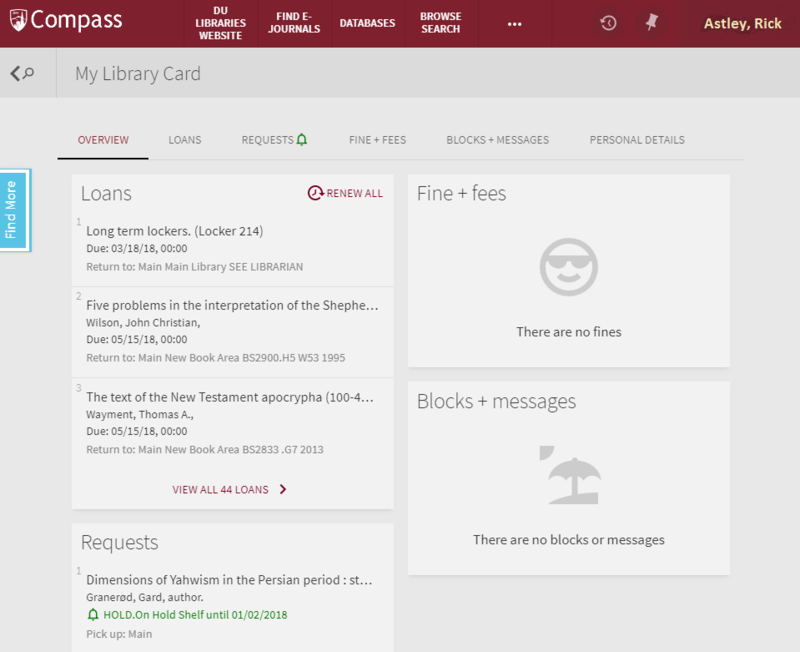 How do I access my library account in Compass? 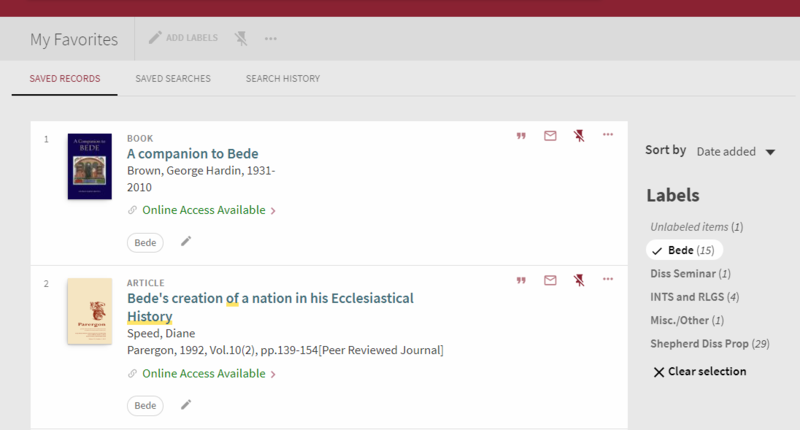 Your library account contains powerful features to manage your research as well as items checked out to you, requested by you, or held for you. While it is possible to browse records for the library's physical and electronic holdings without signing in to your account, you will find a more powerful set of features if you sign in to your account. Look for the appropriate Library Account or Sign-in button on the library's homepage or any search results page. By logging in, you can also view the books you have checked out, renew an item, or see what items you've requested. 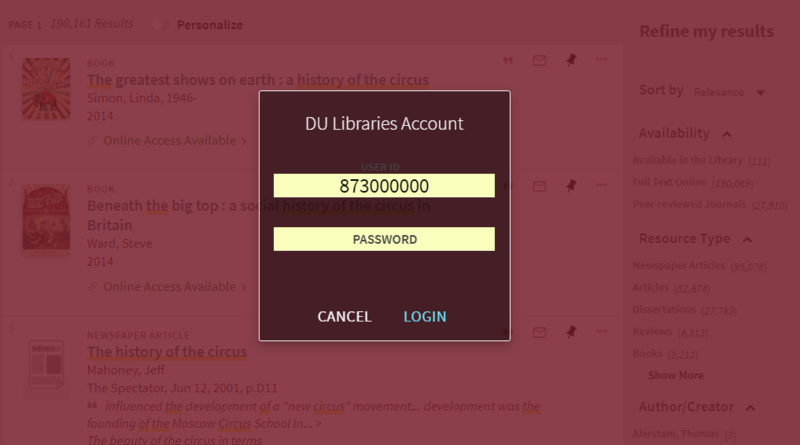 You should see a red DU login screen like the one displayed below, where you can login with your DU ID and passcode. The login should be the same one you use for PioneerWeb. Once you have successfully logged in, you will see your name appear in the maroon menubar, along with some additional options. If you click on "My Library Card," you will be able to see significant detail about your library account: books and items checked out to you, requests being fulfilled or ready to be picked up, fines and more. Most of this will appear in you library card "Overview," but you can select the tabs for additional details. Loans: This option allows users to view their currently checked-out items, along with the expected due dates for each item. Users may requests renewals from this menu for individual items as well. Requests: Hold requests are listed here. Fines & Fees: Any fines or fees associated with a user's account will be listed here, with a brief explanation of each. Blocks & Messages: It is rare that a user will have an account block, but any issues with an account will be listed here. Personal Settings: Compass offers a number of advanced setting options for users, including language type, the number of resources to display, and personal information. Users may also select their "career path," which prioritizes results based on academic interest. If you click on the pushpin icon to the left of your name, you will be taken to your "Favorites." This menu was formerly referred to as your e-Shelf, and allows you to save items and searches for later browsing. You can also categorize items with labels by subject or by class with user-selected labels. Saved Records: This feature allows a user to make a list of favorite items for easy browsing. Users may organize these bookmarks into folders, and write notes about individual items and folders for easy reference. Saved Searches: You can save search strings that you wish to peruse again in the future. Search History: This listing will save only those searches performed during your current session, even if you haven't saved them. To exit the Favorites menu, simply click on the magnifying glass icon appearing to the left of your name in order to return to Compass' usual Search mode.